The Dark Tickle Company is Homegrown Success! 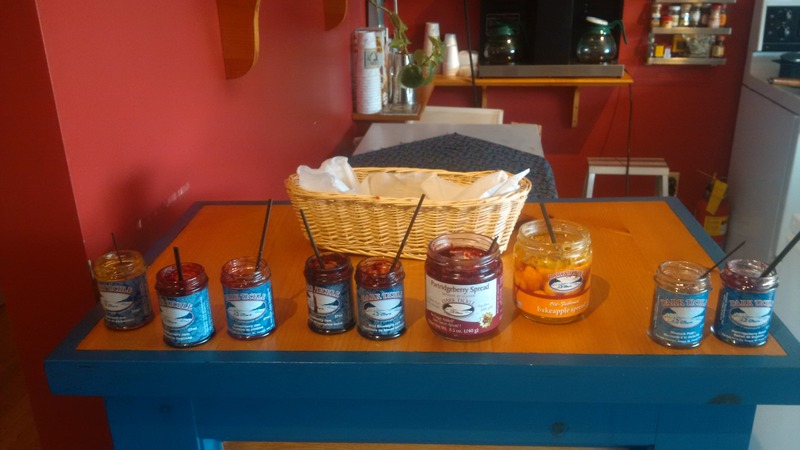 The Dark Tickle Company, St. Lunaire-Griquet on the Great Northern Peninsula, NL offers homegrown wild berry products in the forms of jams, jellies, vinaigrette, syrups, sauces, tea, coffee and chocolate. These berries are picked by hand from a network of approximately one hundred local residents of the Great Northern Peninsula, Southern Labrador and Northern Quebec. One of two Economuseum’s in Newfoundland & Labrador, Dark Tickle is the place where wild berries are processed without any additives. This is the traditional way of our preserving our berries, ensuring only the highest quality and most delicious of tastes. Those visiting Dark Tickle can watch workers prepare the products before their very eyes, as they have a windowed production area. There are panels at their business, as well as information along their boardwalk walking tour. One can gain the full authentic wild berry experience at Dark Tickle. After seeing a downturn in the cod fishery and a moratorium, for a merchant in the fish business it was either close up shop, try to hang in or diversify. The Knudsen’s founded Dark Tickle, which was an early innovator of utilizing our natural wild berry resources to create unique quality products. It has been a homegrown success that has provided local jobs, maintained a year-round operation and promotes St. Lunaire-Griquet and the Great Northern Peninsula all over the world. This is an anchor attraction for promoting tradition, culture, heritage and our rural way of life. I encourage visitors to drop by and visit this family-run enterprise. They have a wonderful gift shop that has incredible Newfoundland and Labrador artwork and gift ware. They are also home to the Granchain Exhibit, which is part of unique part of world history, highlighting the adventures of the French migratory fishery in St. Lunaire Bay and along the French Shore dating back to the early 1500’s. Certainly the Great Northern Peninsula could be an opportunity for more Economuseums given the vast talents of artisans, craftspeople and those who continue our rich and vibrant tradition of producing from the land and sea. We have tangible and intangible cultural assets that must be mapped, a network built and proper marketing. The Great Northern Peninsula has many strong businesses and homegrown success stories, let’s continue to support our local businesses and create new ones! I enjoyed a cup of their crowberry tea, while I scribed this article and recognize big things are happening in our small communities. If you have make the trek up the Great Northern Peninsula and did not have the pleasure of visiting Goose Cove East than you are truly missing out on what is quintessentially representative of rural Newfoundland living. This vibrant fishing town is snuggled around the rugged harbour as homes hug the shoreline. 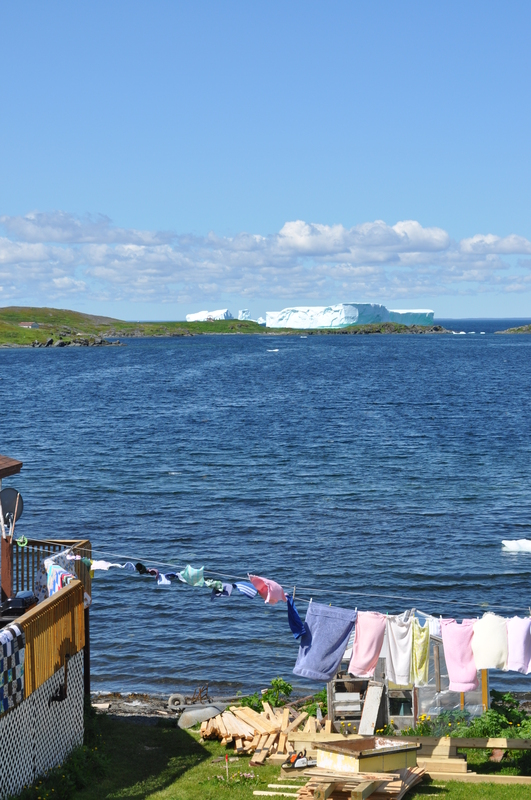 An expanse of walking trails take you to berry patches, gazebos and the ocean with views of whales, fishing boats and of course icebergs (below is a super size one from 2011). The walks are like a living fairy tale! All around Goose Cove is rural living, from the clothes hanging on the line, vegetable gardens, small scale farms, wood piles, root cellars and vernacular architecture. The church and community hall are the prominent public buildings, with a day park for recreational use. The fishery is ever present with boats, fishing rooms, wharves, stages and continues to be the driver of the local economy. Storm damage has resulted in the loss of some of the traditional wharves and stages, such as the Simmonds wharf, which was crushed (depicted in photo gallery above by blue fishing boat). Work must continue to preserve and protect our traditional structures and our inshore fishery. Despite the daunting elements Goose Cove residents are proud of the place they call home. Incredible talented musicians and storytellers have grown-up or connected to this community. They keep passing on their traditions, telling their stories and singing their songs about home. They are quite fortunate of the beauty and all the things and people that make this place home! Goose Cove is gorgeous, and is a must see as you experience all the Great Northern Peninsula has to offer. Newfoundland & Labrador has marketed ‘outport’ or rural parts of the province in its award-winning tourism ad campaigns. Innovative rural companies like Auk Island Winery in Twillingate are continuing to add flavour to the tourism experience. Newfoundland & Labrador takes pride in its unique local berries, such as patridgeberry, bakeapples, squashberries, as well as our very own Screech Rum. This company typically makes berry wines and sells quintessentially on Newfoundlandia. I have tried bottles that are called, “Moose Juice”, “Krooked Cod”, “Jellybean Row” and “Funky Puffin”. I believe part of my purchasing of this product is curiosity, but primarily to support a local business that prides itself in all things Newfoundland & Labrador. 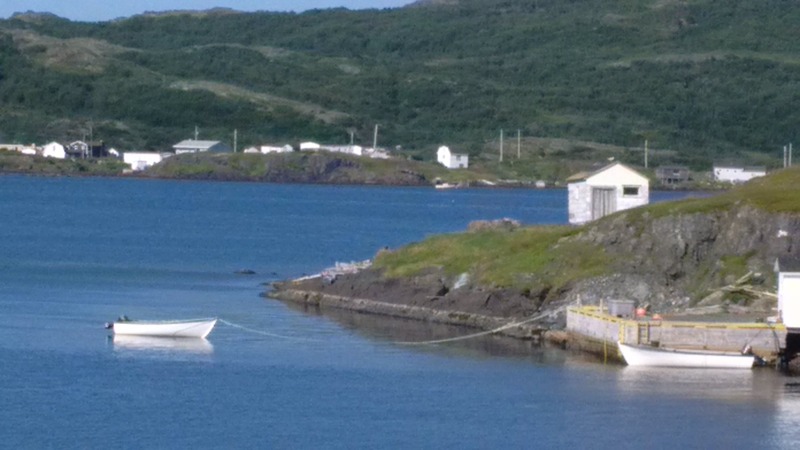 The imagery on Outport Wine, which includes an iceberg, outport boats and fishing rooms. The splash of Screech just adds to the authenticity and certainly begins the storytelling process. This season I hope to tour Auk Island Winery and taste many other wines they have produced in various shapes and sizes. Let’s keep being creative and expand the rural economy and our visitor experiences as we celebrate traditional and modern-day outports. My youthful Grandmother Pearl at 66 years of age is a wonder in the kitchen. She tends to prepare large meals for her extended family on a regular basis. On Sunday, one can suspect that she has a massive pot of salt beef, vegetables, meat and bread pudding cooking for a Sunday dinner. She ensures to hold onto local tradition of ensuring recipes of wild game, fish and beans are mainstays at her table. There is nothing like a piece of fresh halibut out of her pan during the months of summer. Her specialty skills come as a baker. She makes all sorts of squares, buns, rolls, cakes and my most loved item – her freshly baked pies with apples or local Newfoundland berries. There is nothing like a cut of bakeapple or partridge-berry pie and a scoop of ice-cream. Last time I was at her house, she gave me a small sample of her squashberry jam. I can not re-call if I have ever tasted such a local treat. 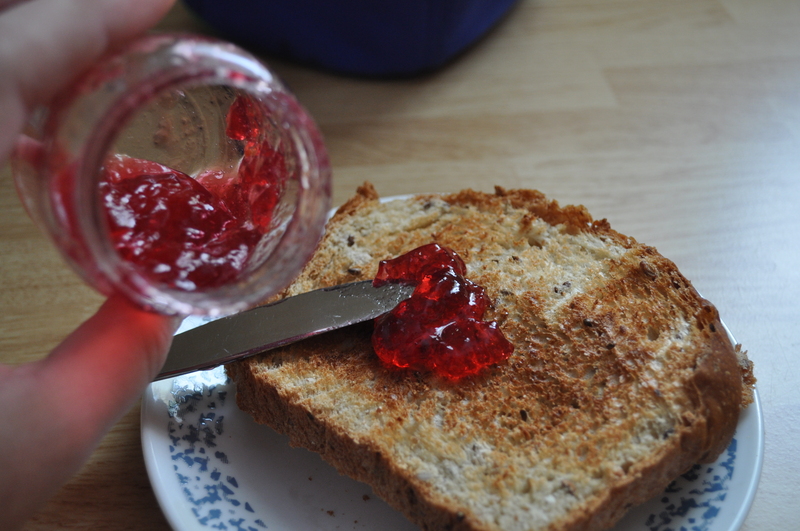 I was eager to place this jam on a piece of toast. It is quite delicious. I look forward to berry picking this summer.